“How can that be in the Bible?” A question Christians have asked themselves many times about many biblical passages over the centuries. My book Dark Passages of the Bible offers a scholarly Catholic framework for answering these questions, in the hopes that it will promote discussion and advance our penetration of the mystery of Scripture through insights gleaned from the writings of Pope Benedict XVI and St. Thomas Aquinas. The book is available for purchase here on amazon.com. Nova et Vetera (Spring 2016): 707-712. Finally, thanks to Dr. Michael Barber over at The Sacred Page for listing Dark Passages of the Bible among his Top 5 Academic Reads of 2014! Multiple gods? Divinely mandated genocide? Rejection of an afterlife? If the Scriptures are the inspired and inerrant word of God that Christians claim them to be, how can they contain these things? For many believers in the modern age, traditional Christian answers to these challenges are no longer convincing. Though spiritually edifying, they are unable to account for the sheer scope and depth of problems raised through the advent of historical-critical scholarship. 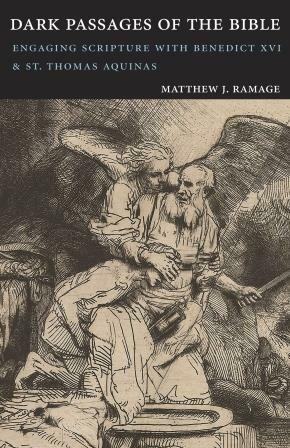 Following the lead of Pope Benedict XVI, in Dark Passages of the Bible Matthew Ramage weds the historical-critical approach with a theological reading of Scripture based in the patristic-medieval tradition. Whereas these two approaches are often viewed as mutually exclusive or even contradictory, Ramage insists that the two are mutually enriching and necessary for doing justice to the Bible’s most challenging texts. Ramage applies Benedict XVI’s hermeneutical principles to three of the most theologically problematic areas of the Bible: its treatment of God’s nature, the nature of good and evil, and the afterlife. Teasing out key hermeneutical principles from the work of Thomas Aquinas, Ramage analyzes each of these themes with an eye to reconciling texts whose presence would seem to violate the doctrines of biblical inspiration and inerrancy. At the same time, Ramage directly addresses the problems of concrete biblical texts in light of both patristic and modern exegetical methods.